Part of a poet’s job includes noticing. Noticing that a sign in the fabric store now says, “Brocades and Sari Fabrics.” When did that change? It makes sense, though. The fabrics are beautiful, rich, jewel-toned and perfect for the saris I’ve seen. The saris I’ve seen on women here in the midwest, anyway. 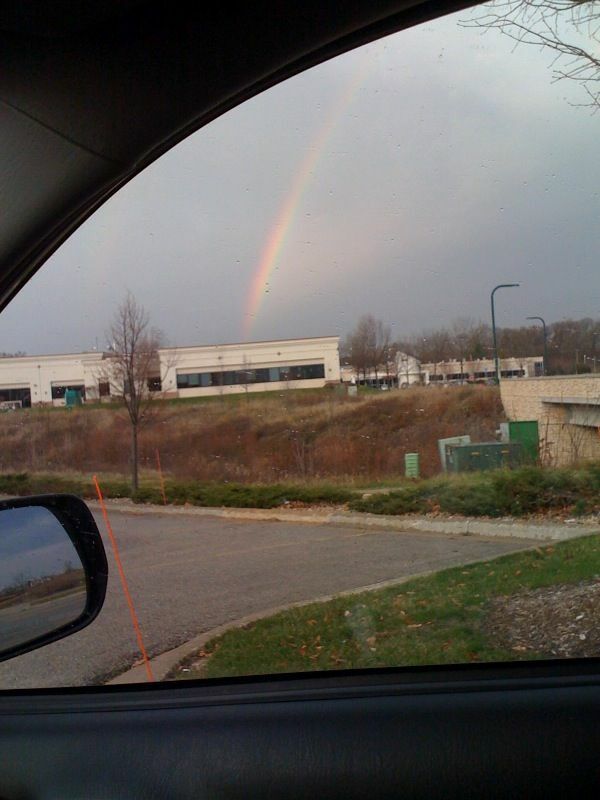 The other morning on the way to work, I noticed a double-rainbow ending just past the building where I work. I pulled over to take a picture, but only one showed up on film. Today I noticed how long the fog lasted. The view out the seventh floor window looked like being underwater until almost noon. I noticed the lake gulls feeding in the parking lot. All of these things will probably end up in a poem(s) and telling more about me than I ever noticed about myself.